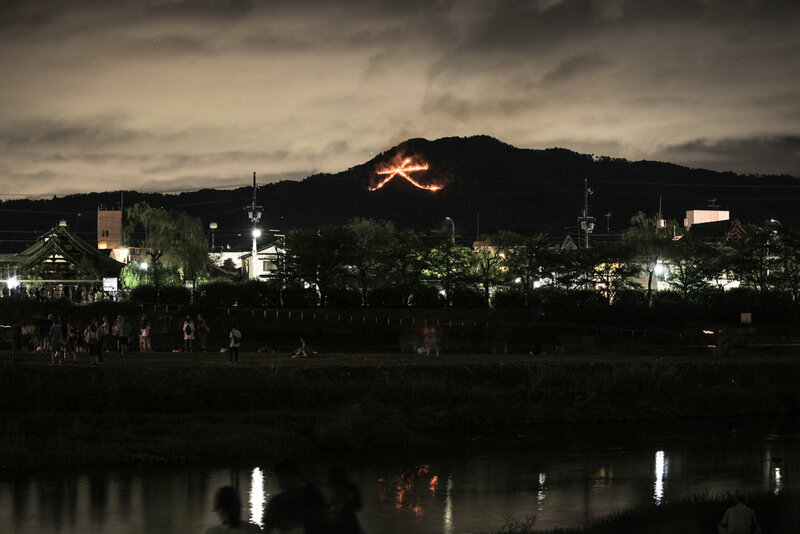 Daimonjiyama (literally “The Big Character Mountain”), is lit up once a year on 16 August as part of Gozan-no-Okuribi to send the ancestors off to the spirit world on the last day of the Obon Festival. It’s the only day when entry is prohibited. The rest of year it’s one of two places with a magnificent view of downtown Kyoto City; the other is Shogunzuka. But Daimonjiyama has the better, wider, view. How Daimonjiyama looks on August 16 from the Kamo River Delta. The character Dai 大, stretches 160 metres across the face of the mountain. The tradition of setting fires to send off the spirits started in 1489, when Abbot Osen Keisan lit the character to send off Shogun Ashikaga Yoshimasa’s son, who had died of an illness aged 25. Also see this Google Maps link. This route is 5.5 kilometres long. Views: One of the best in Kyoto. Overlooks central Kyoto. Difficulty: Moderate, not recommended for people with knee or back pain. Bring a hiking stick if you are not a confident hiker. No climbing, but several steep parts that not will not take more than 15 minutes in total to overcome. The trail is well-marked and you will occasionally meet other hikers. Time: 3-4 hours. Best done in the morning, when the sun shines on the city from behind the mountain, or in the late afternoon, when you will see silhouettes of buildings and hills in the city. Dangerously dark at sundown. Time of year: Anytime, perhaps avoid summer when the mosquitoes eat people alive. Take gloves and scarves in the winter; winds can be strong. Bring: Water for 3 hours, and snacks. Start at Exit 1 of Keage subway station. Walk through the spiral brick tunnel. Consider taking a 1-2 hour detour by going straight to the nearby Nanzenji Temple Complex for its beautiful gardens (especially Konchi-in Temple and Tenju-an Temple), or make a right up the stairs. Stop by the Keage Incline (the disused train tracks) if you are there when the cherry blossoms bloom. Otherwise follow the track towards Himukai-Daijingu Shrine. Enter the shrine and head all the way in. The trailhead is to the left of the main shrine. You’ll know that you’re heading the right way when you pass by a large cave. Once you’re past the cave the trail is clearly marked all the way to the viewpoint. The trail looks like this most of the time. Many cedar trees fell on the path during in the big typhoon of September 2018, but you will be able to clamber over or under them without difficulty. Many of them have been sawed down to allow hikers to pass through. You will arrive at the main viewpoint in 90 minutes. Or 2 hours if you’re taking your time. Enjoy the view and leave no garbage. The view from the summit of Daimonjiyama. Parts of the bonfire. Together they form the character Dai 大, which can be seen all over the city. It gets very windy here. It’s a steep walk down flights of small steps. Follow the trail all the way out into the Ginkakuji Temple neighbourhood. It’s well marked all the way. Explore Ginkakuji Temple, first built 500 years ago by Shogun Ashikaga Yoshimasa. Then take a bus to your next destination, or walk down the Philosopher’s Path towards Eikando Temple or Nanzenji Temple. Happy walking!